Sleeping Bear Press, 9781585361434, 40pp. Illustrated by Linda Holt AyrissReaders young and old will be delighted to discover the wonders of Washington State, from its natural beauty (Mount Rainier and evergreen forests), to its famous residents (Jimi Hendrix and Big Foot) and familiar skyline (Seattle's Space Needle). 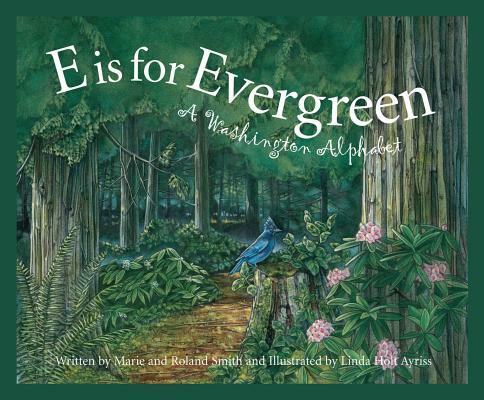 Intriguing facts coupled with beautiful, original artwork make E is for Evergreen an exciting journey.Marie and Roland Smith grew up in Oregon and live on a small farm south of Portland. Roland is the author of many award-winning books for children including Thunder Cave, Sasquatch, Jaguar, Zach's Lie, and The Captain's Dog: My Journey with the Lewis and Clark Tribe, which won the Pacific Northwest Bookseller's Award. Marie and Roland also collaborated on B is for Beaver: An Oregon Alphabet, published in 2003. A professional artist since she graduated from The Art Center College of Design in California, Linda Holt Ayriss also holds a BFA from Pacific Lutheran University, WA. She is the recipient of a silver medal from the Best in the West Society of Illustrators, and has been recognized in the Communication Arts Annual. Linda has taught at Cal State Northridge and is currently mentoring two students in her studio. She lives on Bainbridge Island, Washington, just across Puget Sound from Seattle.